Asthma is a chronic disease that affects the airways of the lungs. Asthma can be mild or severe and is caused by genetic and environmental factors. Symptoms of asthma include shortness of breath, tightness or pain in the chest, coughing, and wheezing. In 2017, around 8.1 percent of the population of the United States currently had asthma. Asthma is more common among females and children aged 5 to 14 years. An asthma attack is a sudden worsening of symptoms that can be caused by certain allergens, illnesses, or strenuous exercise. In 2017, around 3.8 percent of people in the U.S. reported experiencing an asthma attack within the last 12 months. 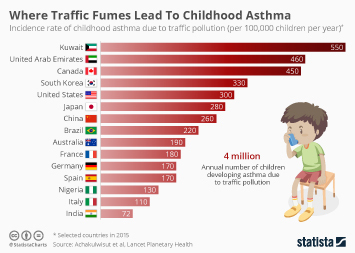 However, around 55 percent of boys and 53 percent of girls aged 0 to 17 years with asthma had at least one asthma attack within the past year. Although asthma can be controlled, it was still the underlying cause of death in one out of 100,000 of the population in 2016. Just as asthma rates are higher among females, rates of death from asthma are also higher among females than males. Medications for asthma include those that treat acute symptoms, as well as medicines which prevent further exacerbation, with some of the most common medications including fluticasone and montelukast. In extreme cases, hospitalization may be necessary to treat asthma symptoms. From 2011 to 2016, around 10.5 percent of asthmatic working adults aged 18 to 24 years visited an emergency department within the past 12 months due to their asthma. Among asthmatic children aged 0 to 4 years, around 31 percent had visited an emergency department or urgent care within the past year due to their asthma, as of 2016. Topic: Allergies in the U.S.